VANCOUVER, BRITISH COLUMBIA--(Marketwired - April 1, 2015) - Alto Ventures Ltd. (TSX VENTURE:ATV) is pleased to announce the recovery of kimberlite indicator minerals (KIM) from the West Fisher claims, located 12 km northwest of North Arrow Minerals Inc.'s Pikoo diamond discovery in northern Saskatchewan (see Figure 1). North Arrow recently reported discoveries of three new kimberlites from their 2015 drilling program on the Pikoo property (see North Arrow's news release dated March 30, 2015). Alto's CEO, Rick Mazur stated, "The recovery of KIMs by Alto on the West Fisher claims is a strong indication that the diamond potential extends to the northwest of Pikoo. The recently announced discovery of three more kimberlites on the North Arrow Pikoo Property and delineation of multiple kimberlite indicator mineral dispersion trains on Alto's adjoining GEFA Property provide further evidence that the North Sask Craton is emerging as a new diamond district in Canada." Twelve of the 37 till samples collected from the West Fisher claims contain Cr-rich chromite KIM grains. Within these, there are five chromite grains from 4 different samples that are of particular interest as they contain very high chromium, ranging from 62.08% to 66.33% Cr2O3, which is above the usual 62% threshold for diamond inclusions. 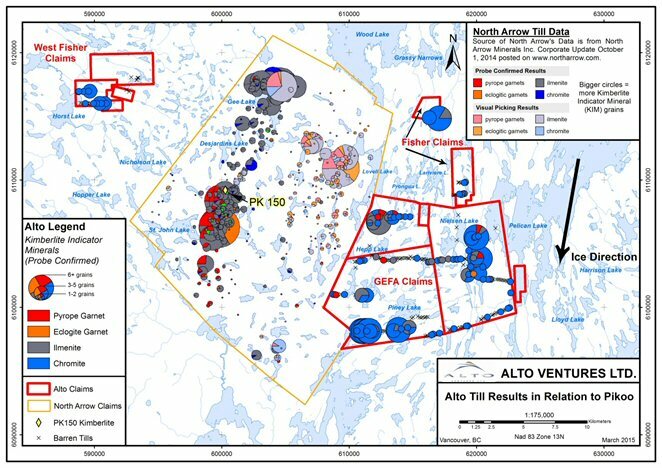 The results reported herein are from samples collected as part of Alto's 2014 till sampling program which covered these claims as well as Alto's GEFA Property. The GEFA Property lies immediately adjacent to the Pikoo diamond discovery to the east. Results from the 2014 sampling program identified multiple kimberlite indicator dispersion trains containing Cr-pyrope garnets, Mg-ilmenites and chromites (see Alto news release dated February 23, 205). One of the KIM trains on the eastern half of GEFA features an eclogite garnet comparable to most eclogite inclusions in diamond (see Alto news release dated January 22, 2015). This previously announced dispersion train also includes a chromite similar to chromite inclusions in diamond, Cr-pyrope garnet, Mg-ilmenites (picroilmenites) and a second orange garnet comparable to Cr-poor megacrysts (a distinctive component of some kimberlites). Additional KIM samples worthy of follow-up are located in the western half of the GEFA property. Alto plans a summer program of further KIM sampling, prospecting and ground geophysics to verify targets identified by a high resolution aeromagnetic survey. Alto's kimberlite and diamond consultant Dr. Harrison Cookenboo, P. Geo, has reviewed field procedures, technical data, and conclusions described in this news release. He is a qualified person under the provisions of National Instrument 43-101 and approves of technical data and conclusions in this news release. Figure 1: http://media3.marketwire.com/docs/ATV41.jpg. Alto's claims are outlined in red. North Arrow Minerals claims are outlined in yellow. Alto is earning a 60% interest in the GEFA claims by making staged payments to the vendors totaling $60,000 over two years and completing $750,000 in exploration work on the property over 30 months (see Alto Ventures news release dated January 27, 2014). To date Alto has paid $25,000 in cash and spent approximately $400,000 on exploration. Alto is earning a 100% interest in the Fisher claims by issuing to the vendor 25,000 shares of Alto and making cash payments totaling $18,000 over two years (see Alto Ventures news release dated January 22, 2014). Alto has paid $8,000 in cash to date. Alto's field crews collected a total of 325 till samples during the 2014 sampling program, using a float plane to access sample sites. Each sample comprised 10 kgs (field weight) of till that passed through a 6 mm screen. Till samples were shipped to the Saskatchewan Research Council (SRC) Geoanalytical Laboratories in Saskatoon for processing. SRC is an experienced laboratory in KIM samples operating in accordance with ISO/IEC 17025:2005. Processing at SRC consists of creating a heavy mineral concentrate, hand-picking the concentrate for potential kimberlite indicator minerals and then electron microprobe analysis of picked grains. Details of SRC's KIM processing routine and quality control are available on the SRC website: http://www.src.sk.ca/facilities/pages/geoanalytical-laboratories.aspx). Picked grains are only counted as kimberlite indicator minerals (KIMs) or diamond indicator minerals (DIMs) by Alto after review of the electron microprobe data using industry standard chemical criteria. Alto Ventures Ltd. is an exploration and development company with a portfolio of highly prospective Canadian diamond, gold and base metals properties. Alto's diamond land holdings total approximately 89,536 hectares in northern Saskatchewan near the recent discovery of diamonds on the Pikoo Project. The Company is active in the Abitibi greenstone belt in Quebec on the Destiny gold property and is exploring in the Beardmore-Geraldton gold belt in Ontario. In Manitoba, the Company is focused on the gold and base metals potential of the highly prospective but relatively under-explored Oxford Lake property.